I seem to have read a lot of psychological thrillers lately, I suspect mainly because they tend to be quick, easy-reading page-turners and I haven't been in the right frame of mind to cope with a great deal more than that in recent months. This one, Into The Darkest Corner, is the debut novel by Elizabeth Haynes, who apparently produced the first draft as part of NaNoWriMo - an impressive achievement. The story is told through alternating narratives, one in more or less the present day and one dated several years previously. At first, you might be forgiven for thinking they're also about two different women: Catherine, the narrator of the flashback sequences, is a carefree, sociable party animal who spends every evening drinking with a large group of equally gregarious friends and is no stranger to the one-night-stands, whereas Cathy is an ultra-cautious loner who has to summon up every ounce of courage simply to attend her office Christmas party and is burdened with severe OCD and anxiety. However, they are of course the same person, and it's a measure of Haynes' skill that she's able to make this dramatic personality change convincing, so that just enough of Catherine is retained in Cathy to make us believe in her transformation. I also found it plausible that the trauma Catherine has suffered would be sufficient to bring that transformation about. Mentally (and physically) scarred from a horrific experience with Lee, a previous boyfriend, Cathy's present-day narrative begins with her meeting Stuart, her kind, attractive neighbour, and deciding to take positive steps towards addressing her mental health problems. However, this coincides with Lee's release from prison, and soon, Cathy starts to see small signs that someone might have been in her flat. Is her mind playing tricks on her, or has Lee decided to return to finish what he started years before? Into The Darkest Corner is unlikely to score many points for literary style but it is a very compelling read, and disturbingly realistic at times - some elements are cranked up a notch in the name of poetic licence but the portrait of Lee's abusive, controlling hold over Catherine is all too believable, and the more graphic accounts of his actions can make for uncomfortable reading as a result, particularly for women who may have similar experiences. There's nothing about the treatment of the subject matter that's sensationalist or exploitative, but it is brutal, stark and uncompromising. While I strongly empathised with Catherine once her relationship with Lee had deteriorated, and also very much so in her new life as Cathy, I found her somewhat tiresome at the start of the flashbacks: not only does she seem to behave as if she's on a permanent hen-night, but she seems pretty superficial. We're supposed to believe that she has fallen head over heels in love with Lee, but this manifests itself solely in her endless gloating over his hunky looks and their incessant shagging, and as Catherine obviously has no problem meeting men, I couldn't quite see what was supposed to be so special about Lee himself. The plot does rely heavily on Lee having an awful lot of charisma and charm, but to me, he seems short on both. It's likely, though, that this says more about me than it does about the novel. Like most thrillers of this nature, parts of the plot do pivot on unlikely coincidences and there are certainly a few moments where one has that same 'Why are you going to into that darkened room to investigate that scary noise on your own,, you silly woman?' feeling that one has when watching certain types of horror film. 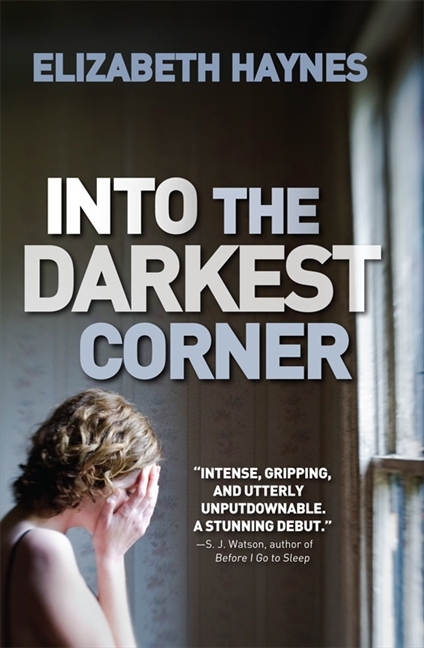 But Into The Darkest Corner is still a very strong debut for Elizabeth Haynes, and definitely one that's hard to put down. Haynes has written two more books since this one, and I'll be looking out for them.